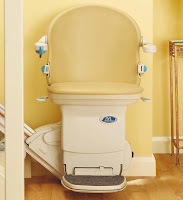 Castle Comfort Stairlifts offers top brand stairlifts, keen prices and fast installs for all those seeking stairlifts in Ellesmere Port, Cheshire . And all work comes with our no-quibble guarantees and famous customer service satisfaction. Give us a call today on 0151 676 004 If however, you are looking for fascinating facts about the area then feel free to read on. Here we are in Ellesmere Port in Cheshire on the banks of the Manchester Ship Canal, an industrial town and port. Maybe you’re looking for stairlift suppliers in the area? Look no further, Castle Comfort Stair Lifts at your service! We have a local office in Macclesfield where our expert team will be on hand to offer you all the information you need to know to help make that final decision. Remember that we guarantee our work so you can be sure any installation you set up with us will be worth its weight in gold/salt. Talking of weight, our cheshire stairlifts can hold weights up to 30 stone so if you’re a little heavy, please don’t let that put you off. Talk to us today to see what we can suggest on 0151 676 004. So here we are in Ellesmere Port another town hugging the bank of the Mersey – or the Manchester Ship Canal in this case. With all the industry that has grown up in the area and with access to the open waters and also to the canal system, it is little wonder that so many of these Cheshire towns are home to ports. The biggest industrial contributors to the area are Stanlow Oil Refinery – mentioned by Orchestral Manoeuvres in the Dark on one of their tracks – and ICI. Vauxhall Motors also produce their Astra cars here, now Vauxhall’s only plant in the UK. Ellesmere Port is located where the Ellesmere Canal meets the Mersey. The canal was built as part of a project to join three rivers namely the Severn, the Mersey and the Dee. The canal does connect to the River Dee at Chester but the project was never completed so the link to the Severn was never made. Ellesmere Canal joined the Mersey at the village of Netherpool later to become Ellesmere Port. The canals were used to transport raw materials, produce and food across the country in the 18th – 19th centuries; it was a cheap and efficient method and made excellent use of the 100+ canals that were built. Railways effectively killed-off the industrial use of the canals as the railways were faster. Ellesmere Port is fittingly home to the National Waterways Museum where visitors enjoy an historic boat collection, the pump house and a visit to the blacksmiths or a cruise up the Manchester Ship Canal. The visitor map is helpful marking trails suitable for push chairs and wheelchairs. There is a lift – though not one of ours – to get you to the top of the Exhibition Hall. Whilst we’re on the subject, remember that Castle Comfort Stair Lifts can help you get about especially in your own home – though we do also supply commercial wheelchair and passenger lifts. Our local office Macclesfield will be happy to advise and as we are the national agents for all UK manufacturers, there will be something that suits you, your home and your pocket. Please call Castle Comfort Stair Lifts for more information on 0151 676 004. Staying with the water theme, something all ages can enjoy is the Blue Planet Aquarium where youngsters can swim with sharks or see ‘amazing amphibians’ including a number of frogs – red-eyed tree, golden or green dart frogs, tomato frogs and more. Another part of the attraction is the Aquatheatre where you can see and hear about some interesting water creatures including the beautiful but aggressive French Angel Fish, the Big-eyed Squirrel Fish that sometimes swims upside down and the Atlantic Spadefish that favours ship wrecks; or enjoy the Pirate’s Playground. The Cheshire Cat first appeared in Alice’s Adventures in Wonderland by Lewis Carroll. Unfortunately the Cheshire Cat with his knowing grin is completely fictional. Its origin beyond Alice is unsubstantiated; it could be a reference to happy cats in the County of Cheshire where so much milk is produced! Or from cheese production when cheese was sold in moulds resembling a cat who was grinning! When ‘grinning like a Cheshire Cat’ refers to humans it means that we are grinning showing our teeth and gums! English footballer Sam Chedgzoy was born in Ellesmere Port and played for Everton. Controversially he changed the laws of English football when he scored a goal – well almost – dribbling the ball from a corner. The year was 1924. Prior to this, goals from corners were only allowed if another footballer also had contact. Ex Deputy Prime Minister John Prescott who served under Tony Blair went to school in Ellesmere Port. Beverley Hughes aka Baroness Hughes of Stretford was born in the area and also served under Tony Blair. Comedian Hardeep Singh Kohli, star of radio and TV lived in nearby Little Sutton. ‘Charles Bronson’ aka the most violent criminal in Britain lived and committed offences in the area; he began his career as a bare-knuckle boxer in the East End of London. If you’re not grinning like a Cheshire Cat or you’re feeling like a bare-knuckle fight to get what you need, remember Comfort Castle Stair Lifts are here to help. No need to rage if you’re frustrated that you can’t get about like you used to or if you think you can’t afford a stairlift. 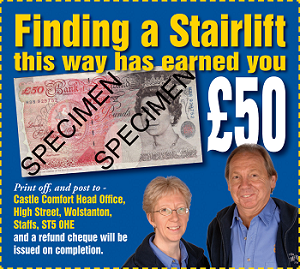 Castle Comfort Stair Lifts can point you in the direction of funding through grants or even 0% finance so that you can take advantage of our £50 voucher immediately. Don’t forget we can also offer you a chance to part-exchange your old stairlift or take a look at our reconditioned models too that might fit your budget better. Whatever you do, give us a call so that we can discuss your needs and come up with a solution. Our local office number is 0151 676 004.